We present an application capable of control the azimuth, elevation, and distance of sound objects in real-time. 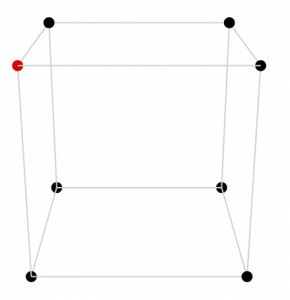 This 3D spatialization is done by computing the interpolation of a maximum of four HRIRs, depending on the virtual location, in real-time. 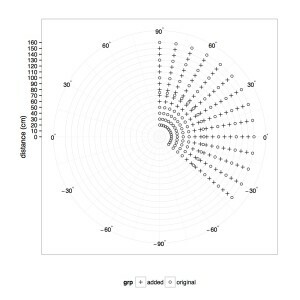 Discrete impulse response locations. Original and interpolated kernels are denoted by ◦ and ×, respectively. 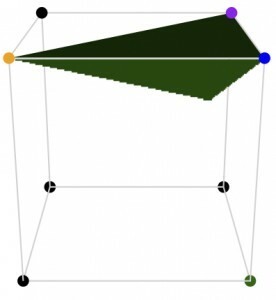 Spatial audio cues are important in virtual environments to increase realism. Convolving sound sources with a binaural head-related impulse response (HRIR) is a popular technique to spatialize them. HRIR measurements are usually captured at a fixed distance, limiting the locations to points on a spherical surface. HRIR datasets including recordings at different distances have become available. 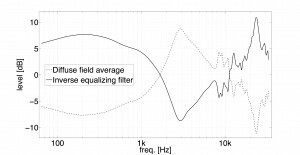 Diffuse field average and its inverse used for diffuse field equalization. 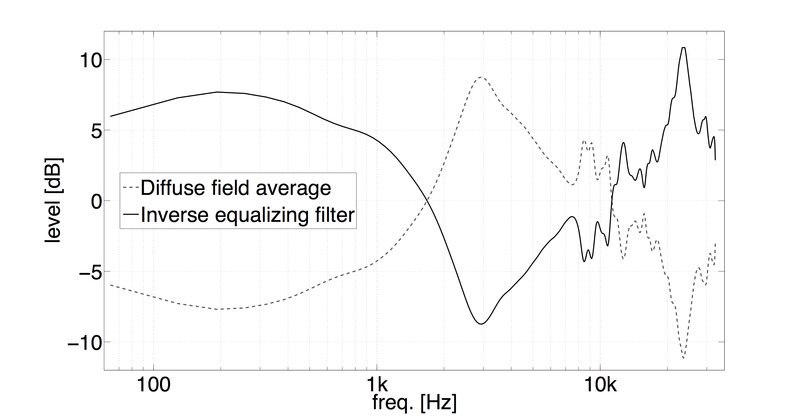 Note that the original recordings are high-pass filtered with a cutoff frequency of 70 Hz. 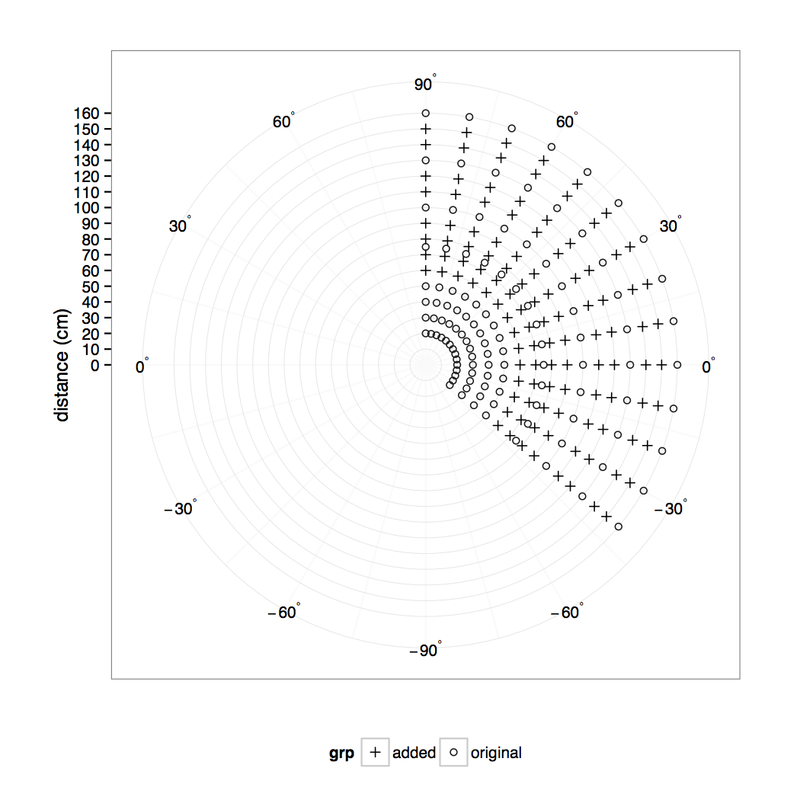 Regularize grid: spacing 5º in azimuth, 10º in elevation, and 10 cm in distance. Only the right hemisphere HRIRs were stored in a SQLite database for the real-time application. Create a Pure-data object named hrir˜. 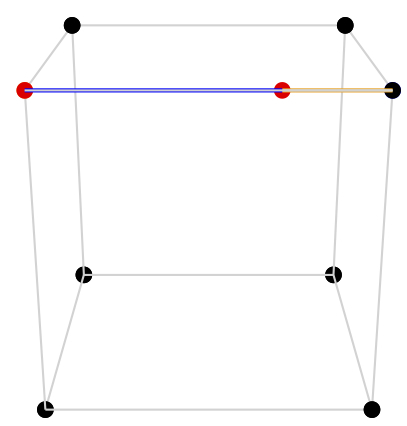 Up to four HRIRs are selected for interpolation. Convolution is computed for every DSP block in Pd (64 samples by default). 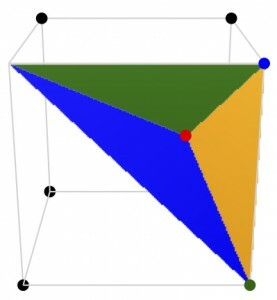 Fresh interpolations are performed only if the location of the virtual source is changed. Users can specify the number of taps to be used in the interpolation as an argument of the hrir~ object. This number of taps must be a power of two. Tianshu Qu, Zheng Xiao, Mei Gong, Ying Huang, Xiaodong Li, and Xihong Wu. Distance-Dependent Head-Related Transfer Functions Measured With High Spatial Resolution Using a Spark Gap. IEEE Trans. on Audio, Speech & Language Processing, 17(6): 1124–1132, 2009. J. Villegas. Locating virtual sound sources at arbitrary distances in real-time binaural reproduction. Virtual Reality, 19(3):201–212, Oct 2015.